Peering down from the 20-seater De Havilland DHC-6 the emptiness of the blue and green sea is suddenly broken by a group of dazzlingly green islands with crescent shaped golden fringes. They are the last landfall before the Americas and as we come in to land the plane skims palm trees, tree ferns and Eucalyptus. The islands could be in the Pacific or the Caribbean - but they’re not; they’re a few of the 6,289 islands that make up the British Isles. Islands scattered around the British coast make up 4.4% of the UK land mass although to be honest 5,000 of them are little more than lumps of rock and only 137 are permanently inhabited. Many British islands have played a significant role in British history whereas others are relatively unknown. One of my favourite lesser-known places are the Scilly Isles. They are part of the Duchy of Cornwall, an archipelago 30 miles southwest from Lands End. 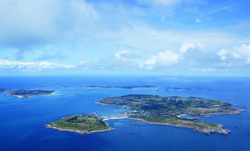 Only five of the 140 islands are inhabited – St Mary’s, St Martin’s, St Agnes, Tresco and Bryher. The combined island population is a little over 2,000, with three quarters of them living on the largest island of St Mary’s. The other islands are a haven for wildlife and seabirds, some visited by day boats, others never visited at all. The Scillies are awash with myth and legend. The entire archipelago may once have been joined together, making up one large island that some people believe was the lost Arthurian land of Lyonesse. They were a popular pirate haunt and the seabed is littered with shipwrecks especially around Bishop Rock – a 50-metre rock column that is submerged during spring high tides. In 1707 several ships of the British fleet were wrecked here with the loss of two thousand lives, now guarded by the UK’s most south-westerly lighthouse. My last visit to the Scillies was in the seventies although it felt like the fifties. The islands are comfortingly old-fashioned – a place where everyone knows each other, visitors can’t bring their cars and front doors can be safely left unlocked. In his first best selling travel book (Notes From A Small Island, 1991) Bill Bryson called Durham ‘A perfect little city …with… the best Cathedral on planet earth’. This is high praise indeed from a man who made his reputation by taking the rise out of everywhere. In the nicest possible way Bryson rubbishes many grubby and unappealing places in Britain and pokes fun at others – but Durham – he can’t find anything bad to say about it. In fact he’s now a regular visitor as the current Chancellor of Durham University. And he’s not alone in his praise of Durham - it was voted the ‘Best city in the UK’ by Condé Nast’s Traveller magazine and BBC listeners voted the Cathedral and Castle Britain’s favourite building. So it’s got a lot going for it, but in that case why do only 0.27% of overseas visitors go there? I suspect its overshadowed by the big marketing budgets of London, Bath, Oxford and York and maybe there’s a perception that its tucked away in the far northeast of England. Durham does get plenty of visitors but they’re mainly locals, so if you get fed up with the tourist crowds in London - Durham is a great antidote. In fact its only 2½ hours by fast train from London on the east coast line, my journey from Berkshire took longer because it was a cross-country route with several stops but it was still a convenient straight through route. “Tell me if you feel a cold hand on your shoulder” shouted the gatekeeper as I climbed the precarious stairway of Micklegate Bar in York, England. York is probably my favourite English city and not surprisingly it’s the capital of Yorkshire in northeast England. It’s said to be England’s most haunted city and it certainly has the best historic ambience. Four stunning gateways (called Bar’s) admit you through the historic city walls into a wonderfully preserved historic center. The Micklegate gatekeeper was warning me about the ghost of Sarah Brocklebank who is said to haunt the second floor. She was the daughter of the gatekeeper in 1797 and whilst a child Sarah hid the gate keys but forgot where she put them. Her father was then cast out onto the street and died a pauper. At the age of 72 Sarah suddenly remembered where she had hidden the keys, she rushed to tell the Mayor but had a heart attack before telling him where they were hidden. Ever since, hundreds of people have claimed to have seen her wandering the second floor or felt her icy hand on their shoulder – not me though! York is a 3-D textbook of 2000 years of history starting in 74 AD when Rome’s ninth legion was ordered north to suppress hostile tribes and establish the northern fortress of Eboracum. Roman’s ruled for 350 years before their Empire collapsed and they withdrew. In 306 Constantine the Great was crowned Roman Emperor while he commanding York. London is predictably the main focal point for most visitors to England. Maybe its because the majority of international flights arrive there or perhaps its iconic images are irresistible to the first time visitor. Samuel Johnson said ‘… when a man is tired of London, he is tired of life …’ I suppose he meant that you could plumb the depths of depravity or reach for the heights of artistic creativity – along with everything in between. Well, that’s still true; but I’m not tired of life but my years of living in London have jaded me or perhaps familiarity does breed contempt? But I don’t think it’s just that; international cities are increasingly homogenous and commercially focused on relieving visitors of as much cash as possible. London has many redeeming features but it also has its downside. It’s so big, the ‘must see’ places are widely spread out and it suffers from all the modern day problems of a mega-city – overcrowding, chronic traffic, rip-off merchants, petty crime and over priced services and facilities – although the crumbling pound is currently easing prices. It’s definitely great if you want glitzy bars, clubs, theatres and shopping but if you’re after a genuine sense of England there are far better places to spend your time. The iconic cities of Oxford and Cambridge are both just an hour by train from London but they are centuries apart in all other respects. The glitz and glamour of the Chelsea Flower Show is like an ephemeral tender bloom – spectacular, even dazzling - but in no way does it reflect the prodigious amount of work required to bring it into flower. I’ve been behind the scenes at Chelsea this year, talking to exhibitors and finding out about the mud and sweat that’s behind the glitz and glamour. It all happens in the grounds of the Royal Hospital Chelsea, one of Christopher Wren’s sixteenth century masterpiece and the tranquil home to the red-coated Chelsea pensioners. That is until May each year when pandemonium breaks out and the RHS Chelsea Flower Show arrives. It starts with a traffic jam of 29 articulated lorries waiting to disgorge the massive sections of the Great Floral Pavilion, which forms the heart of the showground. As usual Chelsea 2010 has drawn the crème de la crème of the gardening world to wow visitors with the extraordinary, the stunning, the novel and occasionally the totally wacky (like Top Gear presenter James May’s plasticine flowers). But behind all the glitz, glamour, celebrity and royalty lay at least eighteen months of hard work, worry and more than a touch of panic before this year’s 97th show finally got under way. The sudden appearance of the Chelsea Flower Show is a sure sign that spring is well and truly here but it also gives visitors a glimpse of what summer has in store. 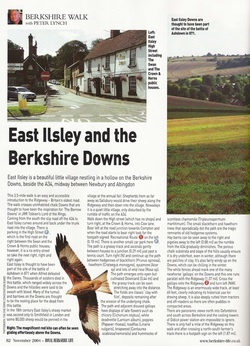 East Ilsley is a beautiful little village nestling in a hollow on the Berkshire Downs, beside the A34, mid way between Newbury and Abingdon. The 3.5-mile walk is an easy and accessible introduction to the Ridgeway – Britain’s oldest road. The walk crosses uninhabited chalk Downs that are thought to have been the inspiration for ‘The Barrow Downs’ in JRR Tolkien’s Lord of the Rings. Coming from the south the slip road off the A34 to East Ilsley curves around and back under the trunk road into the village. There is parking in the High Street P, which is the first road on the right between the Swan and the Crown and Horns public houses; however, it is a no entry street so take the next right, right and right again. East Ilsley is thought to have been part of the site of the battle of Ashdown in 871 when Alfred defeated the Danes. Thousands of soldiers died in this battle, which ranged widely across the Downs and the hillsides were said to be awash with blood. Many of the Tumuli and Barrows on the Downs are thought to be the resting place for the dead from this battle. In the 18th century East Ilsley’s sheep market was second only to Smithfield in London and some 80,000 sheep would be penned in the village at the annual fair. Shepherds from as far away as Salisbury would drive their sheep along the Ridgeway and then down into the village. Nowadays it is a quiet little village, only disturbed by the rumble of traffic on the A34. Larkrise to Candleford is a very rare piece of English literature in that it was written by a woman from a poor rural hamlet in the 1880's. 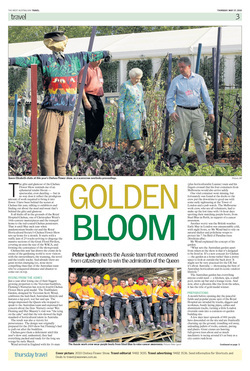 Flora Thompson was a remarkable woman who worked hard to educate herself out of rural poverty. Brought back into the public eye by a rather twee BBC TV adaptation it is still a remarkable read. 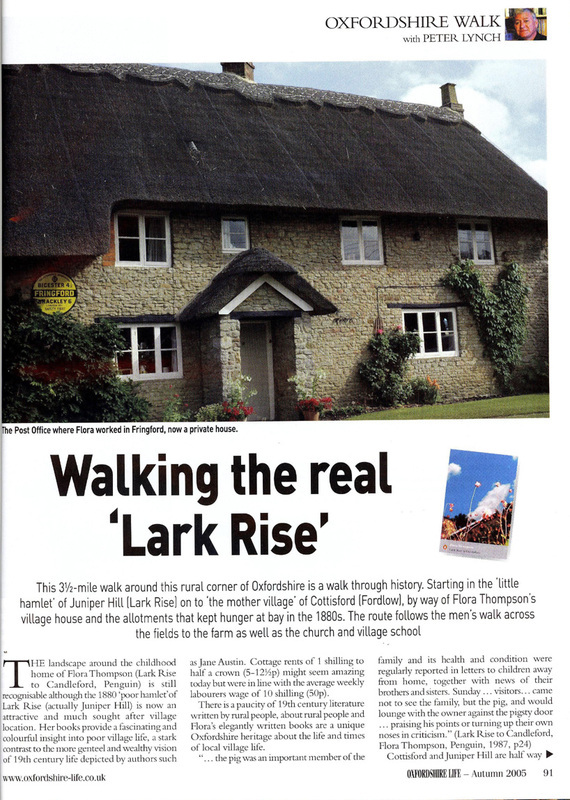 Her fictional hamet of Larkrise is actually the hamlet of Juniper Hill and is remarkably unchanged although its now a much sought after middle class Oxfordshire village. It’s many years since I was last in Newcastle. If you’ve seen the iconic Michael Caine film - Get Carter – well it was pretty much like that. Grim, but once you’ve got your head around the accent; Geordies are as friendly a people as you’d ever meet. So I was surprised to hear OK magazine reporting that the Geordie accent had been voted the UK’s sexiest accent – thanks mainly to style icon Cheryl Cole. Then I read a 2010 Trip Advisor poll that Newcastle-Gateshead had been voted Europe’s third best city for nightlife, just topped by London and Berlin. This didn’t sound like the Newcastle I knew, so, Whey aye, mun! I’m gan back to the toon of Noowcasstle to see for mysel. Its less than three hours by train from London or you can fly direct from Perth with Emirates where you can expect a more relaxed and friendlier welcome than you’ll get at the chronically crowded Heathrow airport. All the industrial grime has gone from the buildings and the quayside has become a smart riverside walkway with pubs and restaurants instead of derelict warehouses, cranes and car breakers. But not everything has changed; the Crown Posada is one of the oldest pubs in town, its still there, still full of friendly folk and still selling superb local ale. Three doors away I spot Martha’s Champagne and Fizz bar, my first inkling of the party town. The new Hollywood film ‘The Eagle’ weaves a story around the mysterious disappearance of the Roman Empire’s battle-hardened ninth legion in northern Britain around 108 AD. The film uses a modicum of historical information suggesting this elite infantry force of 5,000 was wiped out by a band of ‘barbarians’ (i.e. anyone who wasn’t Roman) in a military catastrophe that shamed the empire and prompting a conspiracy of silence. A few years later Emperor Hadrian ordered the building of a wall to cut Britain in two, spanning 73 miles from Newcastle to Carlisle it took ten years to build. This unbelievable feat of construction includes 16 stone forts, 80 mile-castles and 160 observation turrets. Although there are more majestic Roman buildings this is the largest and most impressive historical monument in Britain – built with more than 24 million stones, making it more massive than all the Egyptian pyramids put together. 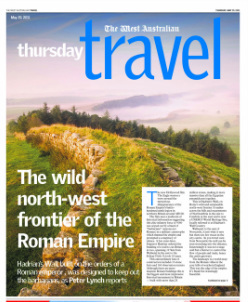 This is Hadrian’s Wall, on Roman’s wild and untameable northwest frontier. It snakes across the hills and escarpments of Northumbria in the east to Cumbria in the west and is now a UNESCO World Heritage Site, locally referred to as Hadrian’s Wall Country. Wallsend, to the east of Newcastle, is just what it says but there are few traces in the city centre. As you travel west from Newcastle the wall can be seen stretching into the distance. Interestingly it was not a siege wall but barrier to control the flow of people and trade, hence the 80 mile-castle gateways. All cities are multifaceted but when explored from a different angle, even residents can make surprising discoveries. While I lived in London the Thames was simply an impediment that had to be crossed every day. But since walking the Thames towpath from its source in the Cotswold Hills (near Gloucester) to London I see the river in a very different light. London (Londinium) was already an old settlement when the Romans invaded England in AD 43. Six to seven thousand year old stone axes have been found in the Thames along with a continuous timeline of archaeological treasures, which can be seen at the Museum of London (www.museumoflondon.org.uk). The river Thames is tiny in global terms, barely 216 miles from source to sea but it makes up for its diminutive size with a big history. As well as flowing through one of the world’s great cities it also flows through historic towns, picturesque villages and the lush meadows of Gloucestershire, Oxfordshire and Berkshire. Seeking the source of the Thames may not be as exotic as searching for the source of the Nile but it’s quite something to step back and forth across the first trickle of the Thames; marvelling that in a few days that water will be flowing through the five-mile estuary at Southend into the North Sea. There is a towpath that hugs the Thames, which was originally designed for horses to tow river barges of wool, coal, and wheat to London. Now walkers can hike from its first dribble to the mighty Thames barrier, built to protect London from storm floods. The entire walk from source to London would take a couple of weeks although from source to Windsor is by far the best stretch and could be done in just over a week. 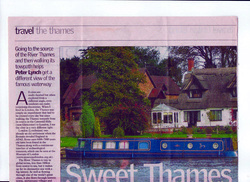 The Thames trail is easy walking as it meanders past castles, colleges, churches and palaces that line its banks. But what makes it perfect are the country inns and pub B&B’s within walking distance every day. They make a perfect end to a glorious sunny day or a cosy end to a soggy day if it’s raining.